Bowie State’s historic season came to an inglorious conclusion in the second round of the NCAA Division II Playoffs. 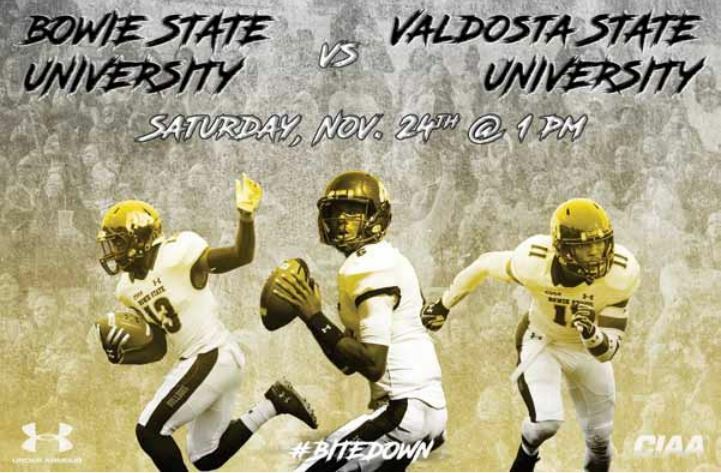 The resilient Bulldogs, who mastered the art of the comeback all year, finally met their match against one of the nation’s elite programs from Valdosta State losing 66-16. The Bulldogs finished the season at 10-3, with a CIAA Championship, and their first ever victory in the playoffs. However, Valdosta State is a perennial national championship contender with the pedigree of competing in this tournament and served a post season lesson on a program that was venturing into unchartered waters. Bowie State began with the confidence that buoyed them to victory when they defeated West Alabama a week earlier at home. They struck first and opened a 10-0 lead after all-American quarterback Amir Hall capped an 80-yard drive with an eight-yard pass to Maurice Williams and Gene Carson hit a 32-yard field goal. However, from there it was all downhill. The Blazers blitzed the Bulldogs with an offensive barrage they could never comeback from. VSU outscored them by 60 points after pitching a shutout defensively in the second half and erupting to render BSU’s defense useless. Following Hall’s 72-yard strike to Lesana Sesay in the second quarter, Valdosta scored 45 unanswered points with quarterbacks Rogan Wells and Ivory Durham completing 18 of 26 passes for 261 yards and four TDs. The Blazers also ran through Bowie’s defense for 288 yards and three scores with a quartet of backs shredding them another four scores. 267 yards with two TDs and one interception. With his college work done Hall’s focus now shifts to preparing for the NFLPA Bowl that will give him a chance to work with former NFL players, coaches, and scouts in Los Angeles as the first HBCU Division II quarterback to play in the Union’s all star showcase for unseen college talent. With two attractive FCS job openings, national searches have begun at Howard and Morgan State for new head football coaches. Each program is navigating through a unique set of challenges while trying to return to contention in the MidEastern Athletic Conference, but both have caught the attention of transitioning coaches on all levels. Howard, who ended the season 4-6, owes former coach Mike London a debt of gratitude for restoring credibility to their program. The lure of coaching in a media market like Washington, D.C. and the prestige has caught the attention of prospective coaches. However, London’s victory over UNLV and the structure that’s in place even though he’s now at William & Mary the Bison may look to hire from within. Morgan has great FCS facilities but face NCAA sanctions for not complying with APR. The Bears are young and talented but need to find a coach quickly who can find a quarterback on the recruiting trail.